We were all brought up to finish the food on our plates, but sometimes it’s more than we really need. These days larger portion sizes are also more readily available, which does mean that it’s very easy to eat too much..
Love your label: Food labels are the best way of checking what you're eating as they can tell you what's hidden inside the food. Once you know what how to use them, you'll soon be able to make healthier choices when you're shopping. Be calorie smart: Counting calories doesn't have to mean you're on a diet! They are a really handy way of helping you choose balanced meals each day, and not eating more than your body needs. 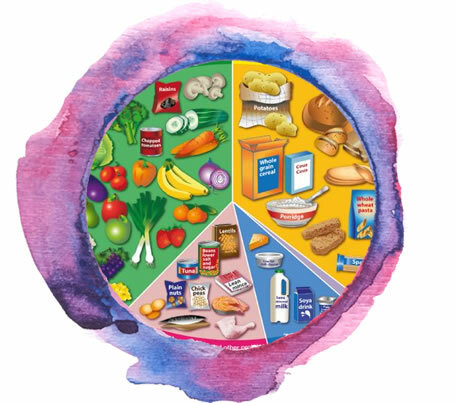 Aim to fill your trolley with a healthy balance of different types of food. Share packaged foods Many foods and drinks are packaged for two adults sharing, so if you’re eating by yourself avoid temptation and save some for later. Eat a little slower It takes time for our brains to register we’re full, so try to eat more slowly. If you’re eating with friends or family try pacing yourself to the slowest eater. Focus on your food Eating distractedly, such as in front of the TV, means we eat more without noticing or even enjoying it. Swap the TV for the table. Aim to feel satisfied, not stuffed Try eating just one plate of food and don’t go back for seconds. Super start your day Don’t be tempted to skip breakfast, even if you’re trying to lose weight. If you have a healthy breakfast in the morning you’re less likely to want to snack before lunch. Mix and match If you know you’ll be having a proper dinner later, keep an eye on the calories by having a lighter lunch. Pack it in Plan ahead and try to take a packed lunch to work or when you are out and about. It can work out cheaper. Spot the difference Swap a big dinner plate for a smaller one and you’ll have a smaller portion. It will also look as if you have more food on your plate too. Max your pocket, not your drink! Extra-large whole milk lattes or cappuccinos may seem like value for money, but they also contain more calories. Try swapping for a regular size coffee made with lower fat milk – less calories (and it’ll save you money). Me-size bowls Plates and bowls are bigger these days - a child-size portion may not look like enough. So try getting child-sized ones for the kids; it’ll make it easier to tell if they’re getting the right amount. Snack time Set a regular healthy snack time for mid-morning and afternoon when the kids are home. It helps train their bodies to think regular food is coming, making them less likely to overeat at meal times. Get the kids involved let the kids watch you serve the meals. This way they’re more likely to understand the different portion sizes for different ages. Start small Give them less to start with - they can always ask for seconds. You’ll have less waste and they won’t eat too much. Just a mouthful If you’re worried about picky eaters not getting a balanced diet, encourage them to try a mouthful of everything on the plate, rather than all of it. You might find they try more things that way. Clear plate conundrums don’t worry if they don’t clear their plate. If they say they’re full, the chances are, they are full! Water regularly if the kids say they’re hungry while you’re cooking, try giving them a glass of water or juice to fill the gap rather than a snack that could ruin their appetite. The Little Black Dress Club is for those individuals wanting to learn about healthy food choices in their diet and how to reduce sugar, salt and processed food on a budget. It is also a useful tool for those who are working towards their own weight loss or weight gain goals. The group meets weekly and includes weigh in, food tasting sessions along with opportunities to take part in activities. An opportunity to meet like-minded people! Reduces risk of a range of (lifestyle) diseases, eg Coronary Heart Disease, Stroke, Type 2 Diabetes. To start tracking your steps, you can use your smartphone. If you have a smartphone without an in-built step tracker, you can still use a pedometer and manually input your step count into the weight-mate app.